It is with great sadness that we report that Hugh Huxley died yesterday following a major heart attack on Monday at his home with Frances in Woods Hole. Hugh was the very first Ph.D. student to join the MRC Unit for the Study of the Molecular Structure of Biological Systems in 1948 under the leadership of Max Perutz, with John Kendrew as his supervisor. During his Ph.D. he began his pioneering studies of muscle structure and function using X-ray diffraction and electron microscopy. 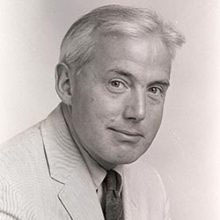 As a post-doc at MIT, with Jean Hanson he proposed the sliding filament theory of muscle contraction in 1954 (simultaneously with A.F. Huxley (no relation) and R. Niedergerke) and described how the interaction between the actin and myosin filaments produced contraction via the cross-bridge cycle. After a few years at University College London in the later 1950s, he returned as one of the founding members of the MRC Laboratory of Molecular Biology in 1962. He was Joint-Head of the Structural Studies Division from 1977 to 1987 and Deputy Director of LMB from 1979 to 1987. In 1987, he moved to the Rosenstiel Center at Brandeis first as Director and then as Emeritus Professor. Hugh Huxley was a great experimental scientist, and continued to work on muscle contraction, with his own hands, until the very end.